I would like to take this moment to announce the first issue of the Santa Cruz Trains Quarterly Bulletin. 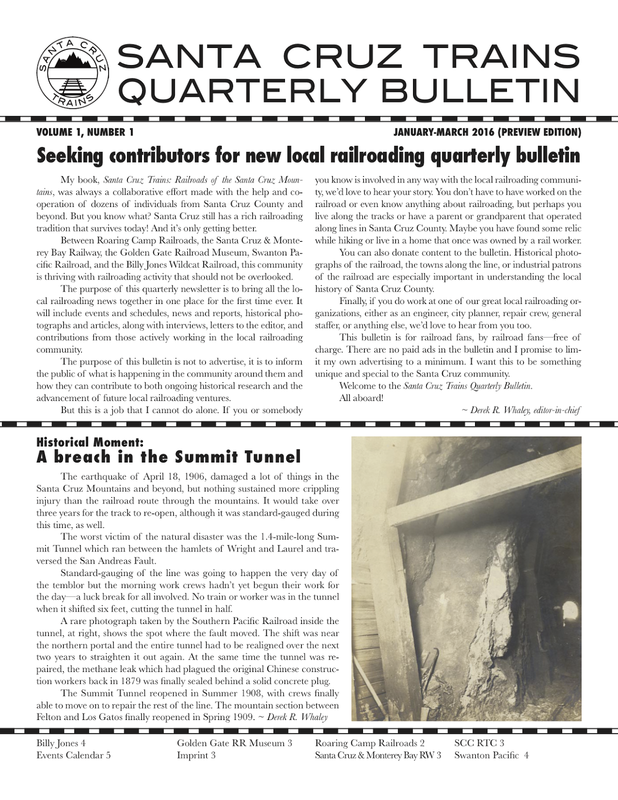 I have taken it upon myself to act as the editor-in-chief of an ongoing quarterly newsletter that will document and publicize local railroading information including current events, benefits, public meetings, historical discoveries, and ongoing projects. It is my sincere wish that all or most local railroad operators and their employees will help in some manner to get this project off the ground. I do not seek renumeration for the project and I do not offer any for my contributors. This is intended to be a locally-led and locally-supported crowd-sourced bulletin with input from all sides. 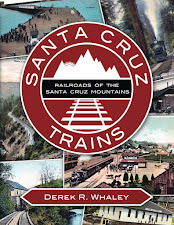 The scope of the bulletin covers Roaring Camp Railroads, Santa Cruz & Monterey Bay Railway, Swanton Pacific Railroad, Billy Jones Wildcat Railroad, Golden Gate Railroad Museum, and the Santa Cruz County Regional Transportation Commission. It will also cover any other organizations that are temporarily or permanently involved with railroading activity including its promotion, documentation, or dialogue. Hypothetically, this is a project that has no set end. As railroading activity increases in Santa Cruz County over the coming years, it is my sincere hope that this bulletin will continue to promote its utilization and expansion. In the face of constant criticism of local railroading projects, it is essential that the Santa Cruz County pro-rail community shares a united front. This bulletin can be a vessel of that campaign. Perhaps someday railroad access will return to Monterey, San Juan Bautista, or even Los Gatos. It is essential that the community is involved in the support and advancement of a pro-rail agenda within Santa Cruz County and its neighboring counties. With that said, this first issue is a preview of the first bulletin distributed now to promote the Los Gatos Holiday Parade this Saturday and the various holiday-related activities promoted by Roaring Camp, the Santa Cruz & Monterey Bay Railway, and the Billy Jones Wildcat Railroad. 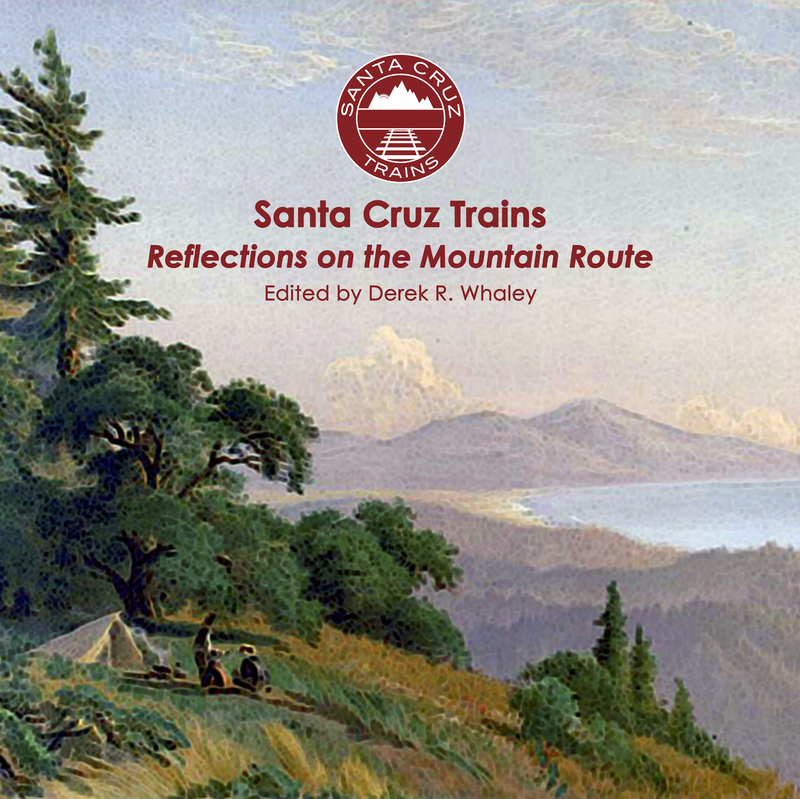 Christmas is an especially important time for local railroading ventures so the support of such activities is needed to advance our collective goal of restoring passenger railroad service to Santa Cruz County. 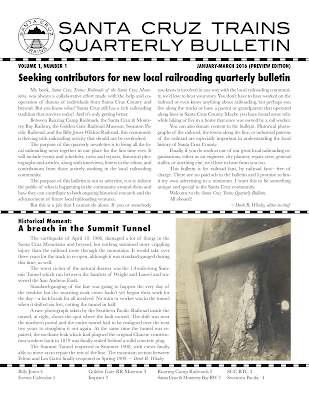 Join with me in welcoming this quarterly bulletin and please contact me to contribute stories, photographs, articles, letters to the editor, recent news, personal histories, recent discoveries, or anything else railroad-related—past or present—that suits your fancy. This is your bulletin and will be as long or as short as the material you provide requires. I don't want it to become simply a marketing vessel for local railroading organizations but rather I'd like a full integration of information relating to every aspect of local railroading. Please help make this bulletin something great.